It’s always interesting what you find wandering through the cemetery. 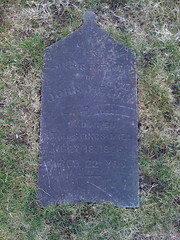 This headstone, which used to vertical until laid flat in the 1960s, is for John Henry Laplant who drowned at Hastings Mill in 1909. The top is based on the design of a Roman tomb, similar to these in Tyre, Lebanon. Update: The headstone has been raised and it was a surprise to find out how thin it actually was. The staff mounted it on another stone to give it strength. At Vancouver, A. E. Bock, sitting as arbitrator under the Workman’s Compensation Act , has made an award of $250 and costs to John Laplant, payable by the Victoria & Vancouver Stevedoring company as compensation for the death of Joseph Laplant son of the plaintiff In the action. Joseph [John] Laplant was drowned at the Hastings Mill in July last year while at work loading the ship Inverclyde. The award was based upon the partial dependency of the father upon the earnings of the son for the support of his household,the son having been a regular contributor to this fund. Messrs. A. Henderson, K. C.and J. H. MacGlll for Laplant, and Mr. C. W. Craig for the respondent. The vessel Inverclyde was a steel barque built in 1898 by Russell & Co., Port Glasgow. Dimensions 245’6″×37’5″×22’5″ and 1634 GRT and 1516 NRT. Originally rigged with double topgallant and royal sails. Launched at the shipyard of Russell & Co., Port Glasgow, for The Inver Line (George Milne & Co.), Aberdeen. Sold to New York & Pacific Steamship Co., Liverpool. Sold to Rederi AB Aura, for £ 30.000. The Finnish measurements were 72,88×11,55×6,96 meters. Captain J.H. Nyroos. Sold to H. Diederichsen, Kiel, for to be broken up.